So, you are thinking of buying a bike in 2019 over the summer or when you start life on the road after you leave school?. 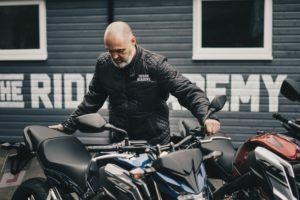 Here is a guide for you, especially if you are inexperienced & never ridden a bike on the road or are looking to take a CBT sometime during the new biking season or prior to it. Remember, a motorcycle is NOT a pedal bike it can go considerably faster & generally speaking it will hurt if you fall off so – we say this quite often when dishing out advice – dress to spill. You will of course require a helmet (Full face preferably), but also factor in a budget for gloves – buy proper motorcycle gloves, not sports gloves or winter gloves, Motorcycle boots – consider work boots if all else fails but no trainers or pumps or sandals of any kind), protective jacket – with padded shoulders and padded sleeves or back of the elbow, no short sleeved or cotton shirt. Preferably leather protecting trousers or strong kevlar lined trousers or you can also pick up denim jeans with also a padded lining similar to a motorcycle jacket from many motorcycle clothing outlets . Always wear the gear when riding. make sure if you need to make any adjustments that these are done prior to setting off. Familiarize yourself with the bike controls. Front brake, throttle, etc usually all in the same place in all the bikes you are ever likely to ride but they do not react the same & may be in different positions some can be dropped or angled while others are straight. Plus some bikes especially scooters may have the rear brake on the handlebar & no clutch or gear lever meaning there are no foot controls. If in doubt practice. Find an empty car park or quiet back street & practice your basic riding such as pulling away from a stop, being confident on the grip of the tyres & braking ability of the bike. You may think this only applies to total beginners but a lot of bikers do this after buying a new bike or if they have a few months off the bike due to injury or the weather & need to readjust. Factor in other controls such as the engine kill switch, turn signals – some click, some are press to cancel, horn, light switches etc Don’t assume all controls are in the exact same position or function exactly the same if you learn on a training school bike then later purchase one of your own..
Make sure the bike is ready to ride before you leave. Shake the bike to see if it has fuel, regularly make checks to the oil & if it’s water cooled, ensure it has coolant. Motorcycles generally require more mechanical maintenance and things like chains have to be set correctly. Plus Brakes on bikes will tend to need to be adjusted & checked more often than a cars. |if something is out of adjustment, do not ride the bike until you have put it right. It seems obvious but train yourself to put your feet down right away when you stop. A lot of people new at riding motorbikes forget this – even if they had ridden bicycles and some ride pedal bikes bicycles every single day (even earlier that same day). If possible always try to keep your right foot on the rest so you can cover your rear brake, this will help with hill starting & also if you get a rear end shunt, so always put your left foot down if it is you prefer to put one foot on the ground & keep your other foot on the brake – this will also engage the brake light so vehicles to the rear will see you are at a standstill. If you are stationary for a long time, pop the bike into neutral gear so you are not putting strain on the clutch or causing excessive wear to the clutch mechanical mechanism which could cause the clutch to drag or disengage, perhaps even slip if it gets to hot from the strain. On a bike in the dry the front brakes are the ones that do most of the work. And NO you will NOT flip over the front unless you really jam on the front brake. Remember you have to pull in the clutch when coming to a stop or the engine will die. Also if you do not shift down while slowing down the engine could stall. Use the engine as a brake as much as possible & only pull in the clutch that final time when you almost come to a stop Once you come to a stop you have to bring the gears down (one at a time) until you get the bike into first. Slow down on turns & if you lean you will find turning is easier. If a friend you are out riding with took the turn at a fast speed, don’t try to copy his pace, ride at your own pace which you feel comfortable with. you can always catch up later – or get there later in safety. Slow down and avoid (if possible), any obstacle in the road and be aware of gravel. wet roads or dirt on the road, also be aware of oil on the road or debris from vehicles – even grass growing in the middle of the lane on a country road can fetch you off so slow down. The law states you can not take any pillion passenger while learning. Unlike other vehicles, passengers can (and will) dictate how the bike steers & even more so if they do not know how to be a 2 wheel passenger. Remember to tell any passenger when you pass your test & are able to carry a pillion, lean to turn with the rider, not the bike. Although you won’t be able to carry a passenger consider if you are carrying a box in the back and part of the bungee strap breaks (or come loose) and it leans to one side (without completely dropping off). You will start to turn.